23”- 42” Tilt Double Arm Swivel LCD LED Monitor TV. Our Bracket is made to fit 23" -42" Inches 3D, LED, LCD, Plasma TVs. The convenient Swivel & Tilt mechanism allows you to adjust the TV angle to get the optimum viewing angle whether it is avoiding glare or positioning it towards the sofa for the perfect view, from anywhere in the room. With Tilt up & down, as well as 180°swivel, the Swivel & Tilt TV Wall Mount Bracket is the perfect wall mount bracket for your TV. Supports VESA standards 50 x 50mm, 75 x75mm, 100 x 100mm, 200 x 200mm and will fit 99% of TVs within the specified size range. Compatible Vesa Sizes: 50 x 50mm, 75 x75mm, 100 x 100mm and 200 x 200mm. Tilt: +15 to -15 Degrees. Distance from the Wall: Minimum 90mm and Maximum 465mm. Maximum Supported Weight: 30kg (66LBS). 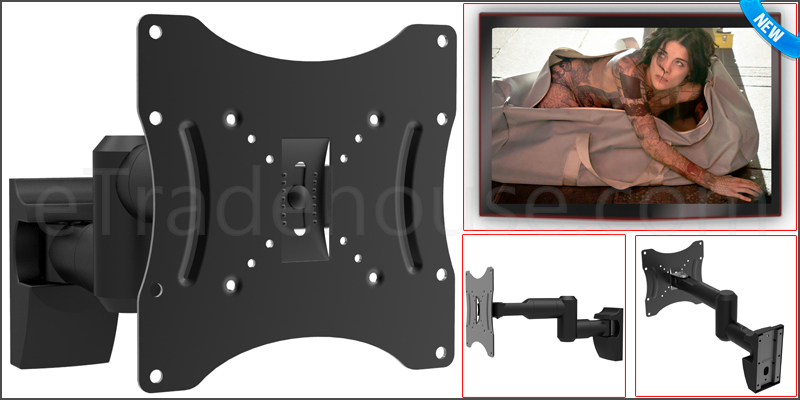 1x 23”- 42”Tilt Double Arm Swivel TV Wall Mount Bracket. Includes all Screws and Fitting for Bracket Wall Installation. Item Packing Dimension: 27 x 23 x 6.5cm.